After a year of work, we have finally been able to republished Br Willie Burton’s book “When God Makes a Missionary”. 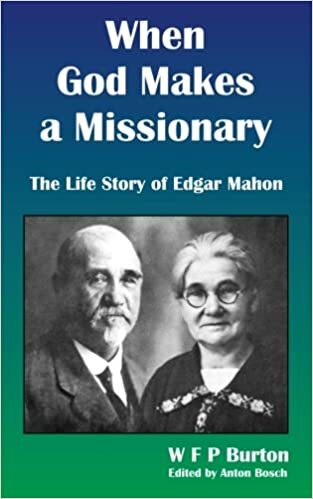 When God Makes a Missionary is the life story of a missionary (Edgar Mahon), written by one of the greatest missionaries of the last century – William F P Burton. This book tells of how God changed Edgar Mahon from a rough-living transport rider, during the South African diamond and gold rush, into a missionary, who would reach thousands with the Gospel and affect the lives of people for many generations. Willie Burton was famous for his ability to hold young and old spellbound by the wonderful stories of God’s great works in the remote jungles of Africa. Stories about miracles, divine protection and provision, and of the transforming power of the Gospel. When God Makes a Missionary will thrill, move you to tears and excite worship through the story of the life of Edgar Mahon. I believe that all young people (and others) should read this very exciting book.